His Honour Judge Brian Barker recognised for his outstanding contribution to the legal system. 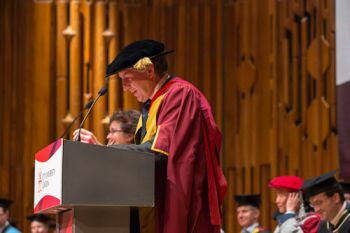 His Honour Judge Brian John Barker, CBE, has been awarded an honorary doctorate during City University London's January graduation ceremonies. Judge Barker was until very recently the Recorder of London, an ancient legal office of the City of London, appointed by the Crown with the concurrence of the Lord Chancellor on the recommendation of the City of London Corporation. He was the senior judge at the Old Bailey and has enjoyed an extensive and distinguished career at the bar and on the bench. Prior to his present appointment, Judge Barker was the Recorder's Deputy, the Common Serjeant of London. Born into a family of schoolteachers in 1945, Judge Barker attended Strode's School in Egham, Surrey. This school was founded by a Master Cooper in 1704. He proceeded to the University of Birmingham from which he was awarded a direct exchange scholarship to the University of Kansas, where he received an MA in Political Science. After attending the former Inns of Court Law School, he was called to the Bar in 1969. His eventful career at the Bar included representing the Crown Prosecution Service in the Stephen Lawrence Inquiry, appearing in the BCCI prosecution trial for the Serious Fraud Office and attempting to represent Wezi Kaunda, the son of the former Zambian president, Kenneth Kaunda. Judge Barker took silk in 1990. Following his appointment as a Senior Circuit Judge and Permanent Judge at the Central Criminal Court in 2000, Judge Barker left the Bar. In 2004, he was appointed to sit as an additional judge in the Criminal Division of the Court of Appeal. A year later, he was appointed Deputy Senior Judge at the Central Criminal Court and the Common Serjeant of London - an office created in the 14th Century. Judge Barker urged graduands to "strive to attain the highest standards of competence and integrity in an increasingly complex environment". He also said that "it was a privilege to be able to administer the rule of law in a free society".